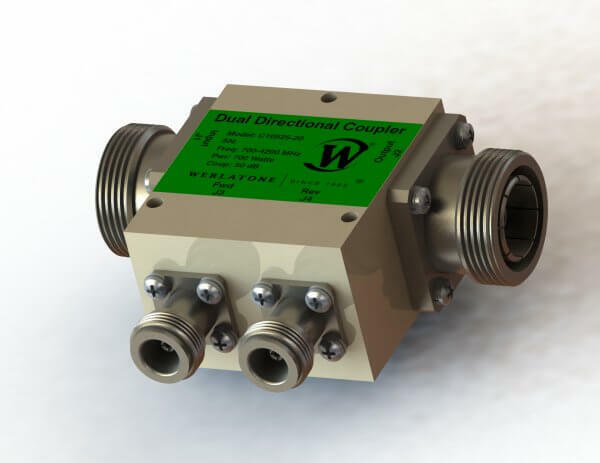 Werlatone's line of 700-4200 MHz Directional Couplers, is highlighted by the Model C10525, rated at 700 W CW. Operating with less than 0.2 dB of Insertion Loss, this compact unit is designed Mismatch Tolerant, and will operate into severe load mismatch conditions, at rated power. The C10525 is available with 7/16 (F), 7/16 (M), and 7/8" EIA Main line connectors. Werlatone’s line of 700-4200 MHz Directional Couplers, is highlighted by the Model C10525, rated at 700 W CW. Operating with less than 0.2 dB of Insertion Loss, this compact unit is designed Mismatch Tolerant, and will operate into severe load mismatch conditions, at rated power. The C10525 is available with 7/16 (F), 7/16 (M), and 7/8″ EIA Main line connectors.